The year is 1957. The world is being taken storm by a wave of new technology. The first artificial satellite Sputnik 1 was launched and Elvis Presley's Jailhouse Rock was holding the number one spot on music charts around the world. All of this happened, of course, long before I was born. 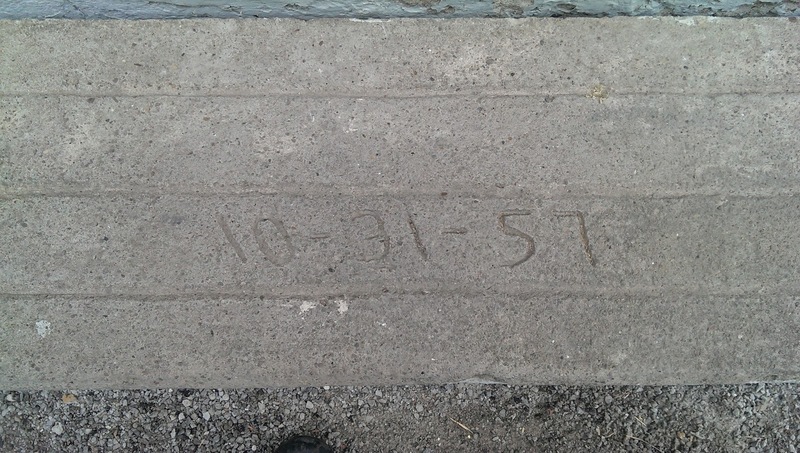 Along with these exciting historical events, a small home was built in Stoney Creek, Ontario. My parents have recently purchased this home with the intention to renovate it into the 21st century. 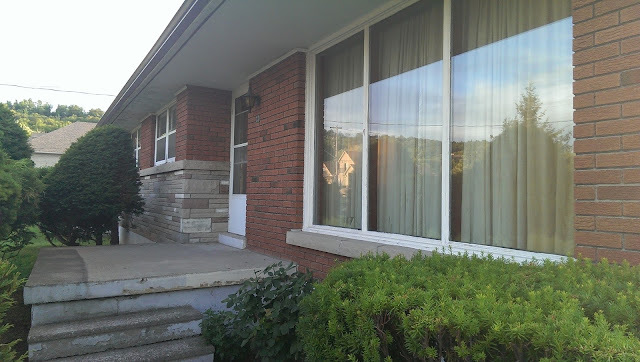 The front of the tired old home (before new windows). I was tasked with networking the home and I decided to take some pictures along the way. I have retrofitted Cat6 and RG6 into each bedroom and living space to pave the way for Home Theater PCs (HTPCs) and "Smart TVs". We use Channel Master 4221 antennas to receive local terrestrial ATSC signals. The RG6 will distribute this signal into each room. I purchased most of the supplies from the local Nutech Electronics and Home Depot. Read on to see more details! 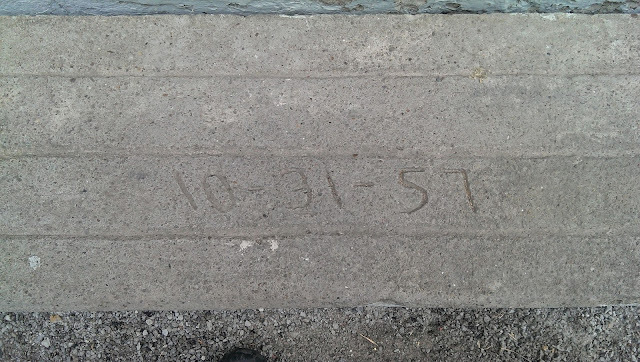 Thankfully this home has an unfinished basement. 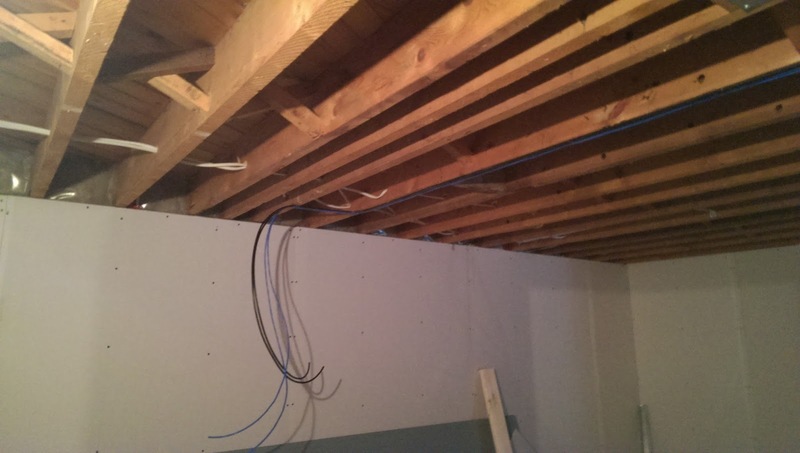 We are finishing it with a drop ceiling which allows me to staple cables onto the bottom surface of the floor joists. 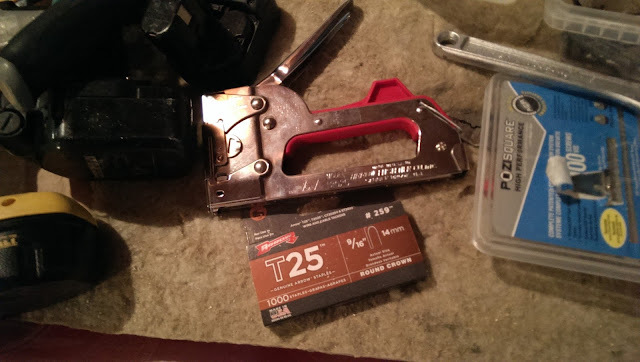 I started out with a good stapler and round "cable staples". The regular rectangular staples have a bad tendency of crushing cables. A good stapler and staples are key. The first RG6 line is intended for the chimney on the other side of the home where the antennas will be mounted. The second is for the TV in the front living room. I have decided to put two network drops in the living rooms. 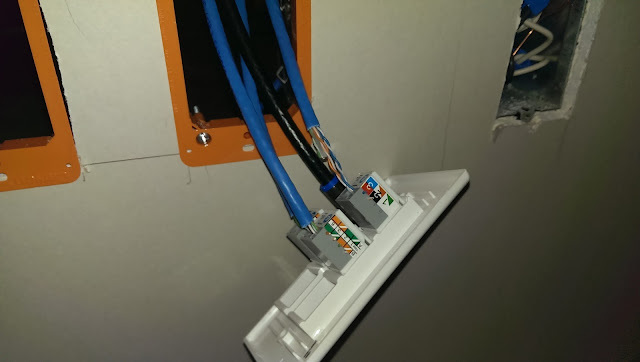 The first run of Cat6 and RG6. All of the RG6 drops are destined for the electrical panel. The network gear will be located in my bedroom next to the server, so all of the network drops terminate at the basement bedroom. I was careful to try to keep the RG6 and Cat6 somewhat separated from the mains AC where possible. In some cases it was simply unavoidable. I am using UTP Cat6 for this job. 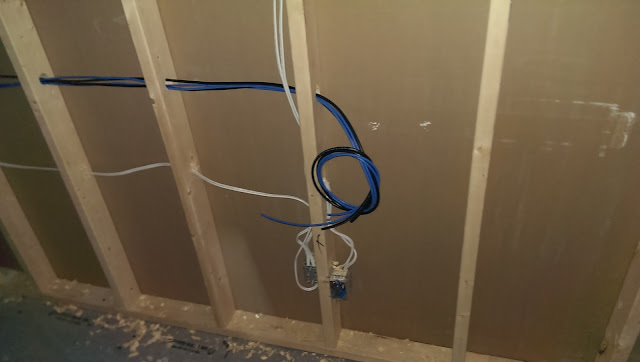 Just the first two Cat6 runs and RG6 connections. I have installed a 1-to-6 splitter to split the antenna signal into each room. 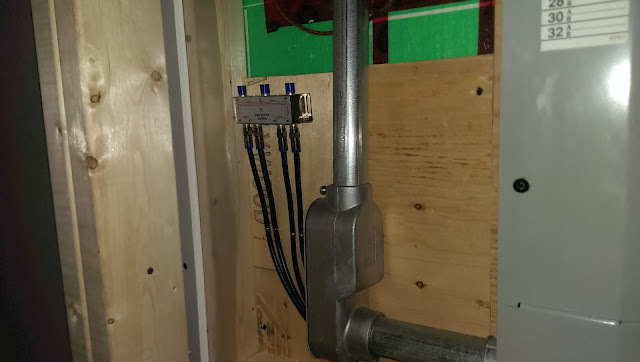 The antenna splitter next to the electrical panel. 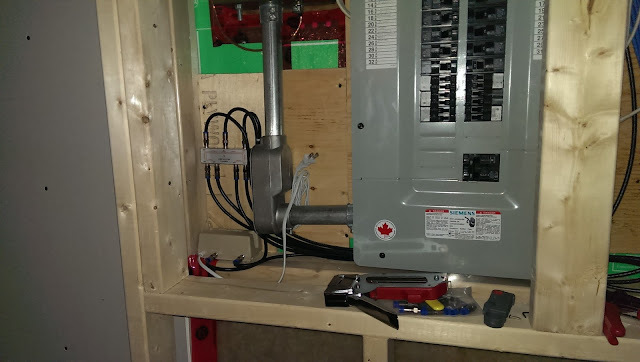 Once I had all of the RG6 lines routed to the electrical panel, I mounted the splitter and installed the power supply for the Channel Master 7777 antenna preamplifier. I was lucky to salvage this CM7777 that had been dropped. There was a small crack on the Power Supply CCA that I was able to repair easily and test. I left 25ft. of RG6 cable on the outside of the home to reach the top of the chimney for the future antennas to be mounted. 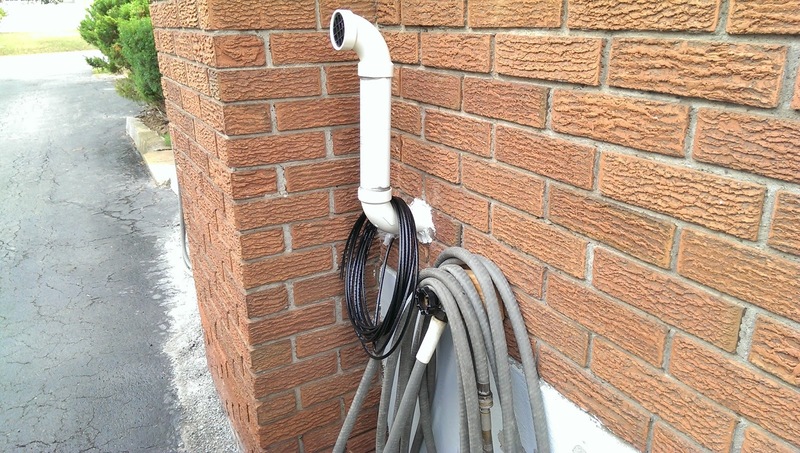 It will be coiled up on the side of the home until after we move in. 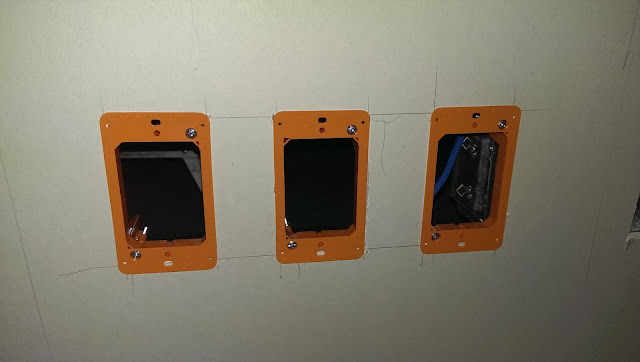 Once I had all of the Cat6 drops routed into the basement bedroom it was time to install the keystone jacks and mount them on wall plates. 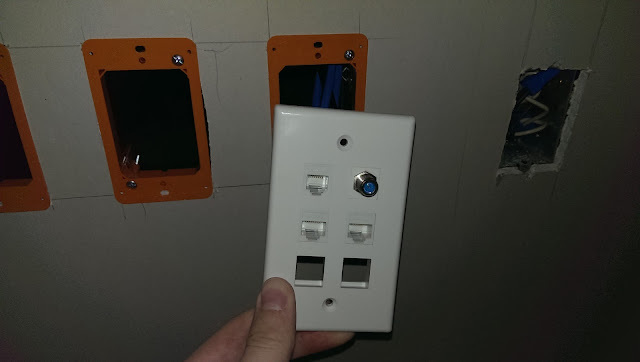 An electrician recommended that I use these fantastic mounting plates. They do not require a stud or a junction box to secure the wall plate to. They simply grip the inside of the dry wall. They are called a "Low Voltage Mounting Bracket" and come in various shapes and sizes. I used the CARLON 1 Gang Low Voltage Mounting Bracket from Home Depot. View from the back of the wall. They mount very easily, you simply make a hole in the drywall and tighten the screws to increase their grip on the drywall. View from the front, inside the bedroom. 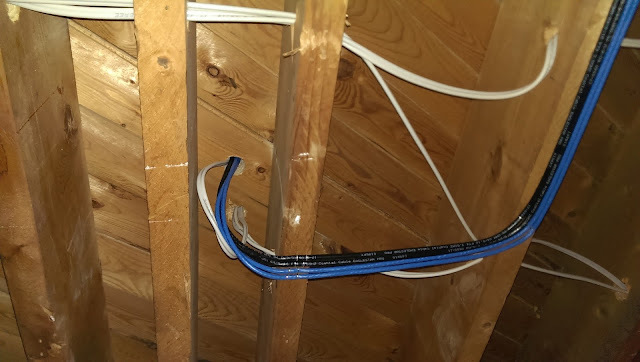 After I pulled the cable, there were RG6 and Cat6 drops hanging from the basement ceiling ready to be routed into the walls in the rooms above. One Cat6 and RG6 drop for each adjacent bedroom. We all have our own cell phones so wiring plain old telephone system (POTS) into each room seemed like a waste. I have simply ran telephone into the basement bedroom where the modem will reside next to the network gear. The right most keystone is for telephone. It is a little sloppy, but the rest are better. The front of the partially completed face plate. The rear of one of the completed face plates in the bedroom on the main floor. Routing the cables from the basement onto the main floor wasn't terribly difficult. 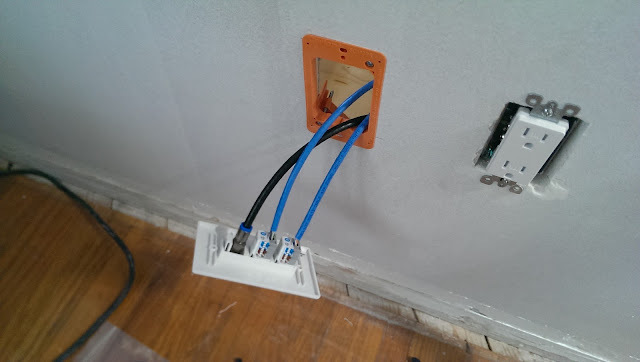 This home had 14/2 wiring which was replaced with proper 14/3 as part of the renovation so there were already holes in the floors that I could use. 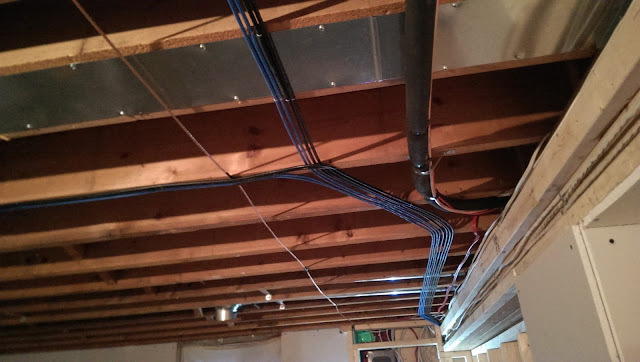 This home was not wired with a ground to each outlet. The wiring was updated to modern Romex cabling that includes a grounded conductor. 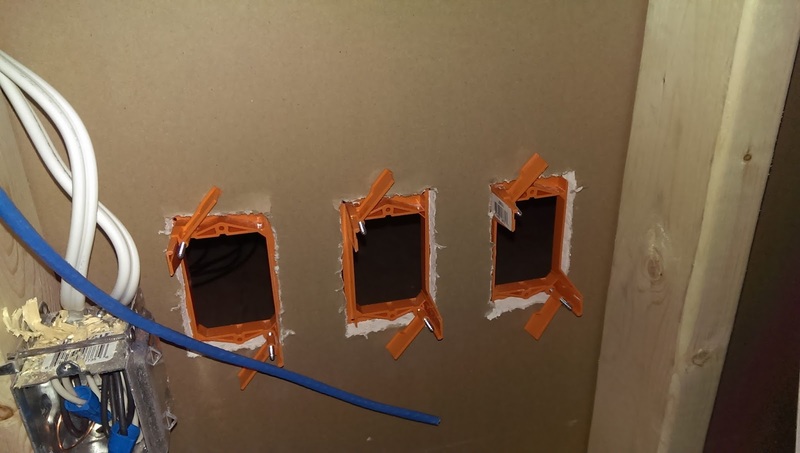 I was able to use the existing holes to help route the cables onto the main floor. Cat6 and RG6 for the master and spare bedrooms. The results of the job were great. Everything looks excellent and passed a basic cable test. Time will tell how well everything works once we move in at the end of the month. This has been a long weekend and I am exhausted. I hope that these pictures and experiences will be valuable to someone in a similar position. Thank for reading! Nice. 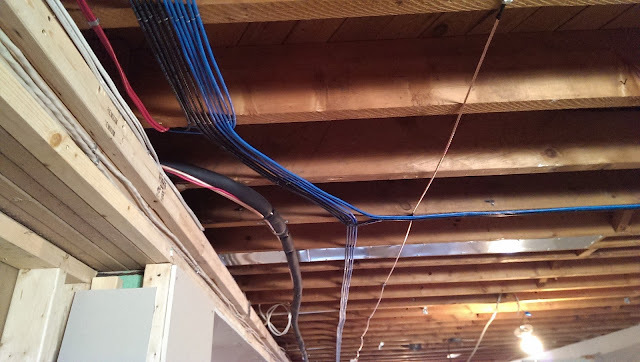 I wouldn't have bothered running the data cables in such nice ordered runs on top of the joists. Just drill a hole and run them through, Now they will interfere once you decide to finish the basement. I think you made a mistake when you said it was finished with 14/2. 14 is just the gauge, and 2 is the number of current carrying conductors. The ground wire is not counted. You mean it was done with cables without ground. 14/3 is something specific, namely a cable with two hot wires, and a neutral, plus ground. In the basement, you need to use at least 2x6 on the exterior walls. Minimum code for insulation of older houses is R20 IIRC. A bat of 6" Roxul will give you R24. Go with 24" on center. Less cold bridges. I just went through the same thing. just much more of it.. Thanks Kent, I have included your correction. 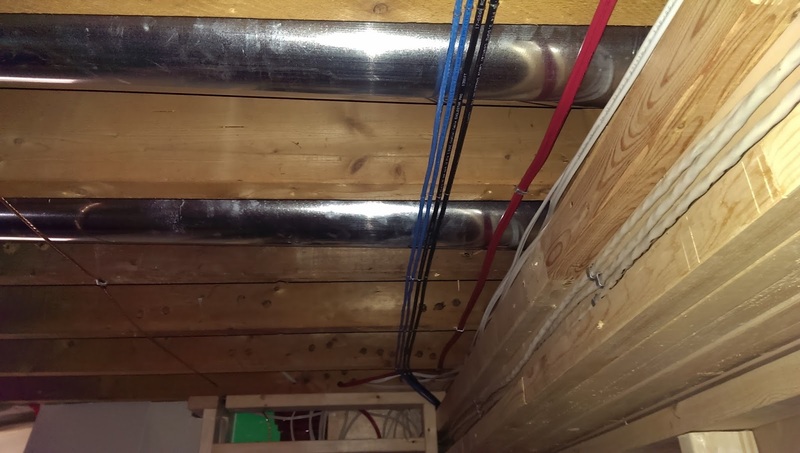 Cables through wall studs or floor beams should be fitted inside a conduit. It would make it much easier to do modifications in the future. You are correct about the pinching, but I was careful to pull back the stapler slightly to avoid it. It probably took a lot longer than it would have if I had the perfect stapler. Very clean installation. I particularly like the orderly runs on the basement joists. Thanks for the post. I'll likely borrow a few of these techniques for a upcoming project I have.